The KNIT tee has been a long time coming! 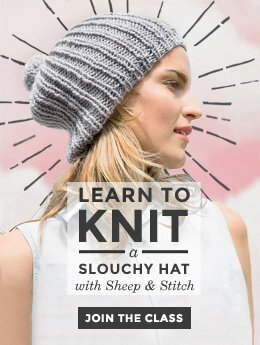 It took a lot of work perfecting it, from choosing the right fabric and the right fit to pondering the best placement of the four letters that spell out KNIT. After various samples, hours spent scrutinising t-shirt fabrics, and countless back and forth with our factory, the KNIT tee is ready for you in the shop! 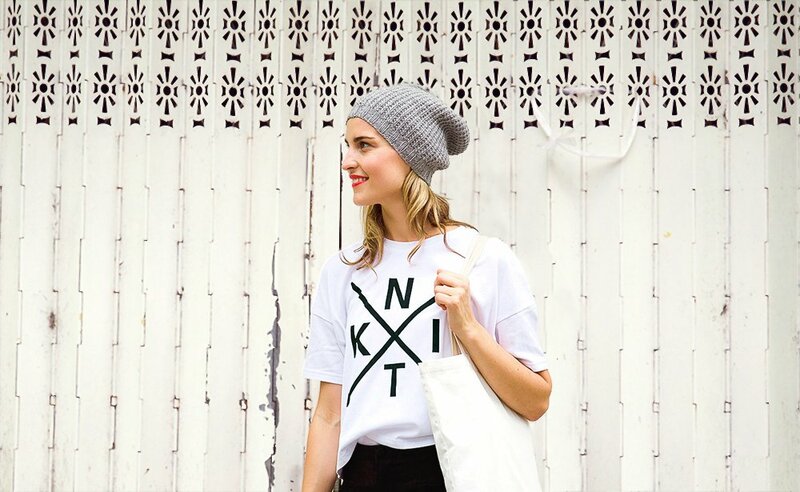 The KNIT tee was originally conceived as a boxy one-size tee that boldly proclaims your favourite thing to do: KNIT! How hard would it be to design a simple boxy tee? Choose a fabric, create a design, and we’re off! Piece of cake, right? A page from our tech pack. For something as seemingly simple as a t-shirt, there are an awful lot of decisions that need to be made. If you forgo using blank t-shirts, like the ones that American Apparel supply, then your list of decisions grows larger. Fabric, fit, inks, design placement, care instructions – these are all features that require attention and detail. And that’s where sampling comes in. Sampling involves sending a factory your tee’s fabric, fit and design details in what’s known as a “tech pack.” This includes every detail you can think of, down to the millimetre. The factory then makes one sample tee based on your tech pack and sends it over for your to review. 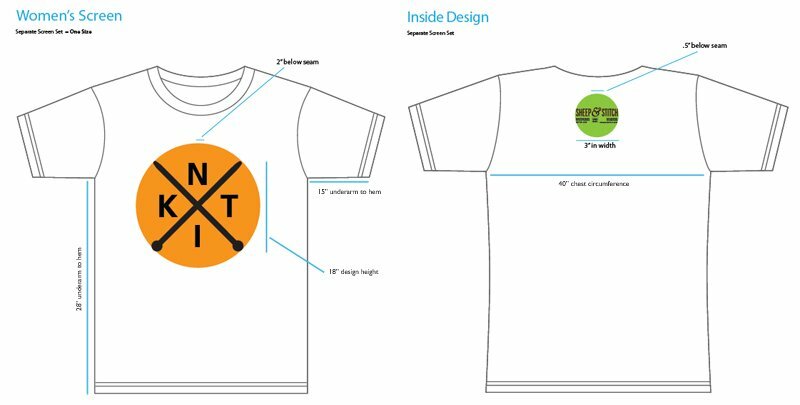 Our first sample of the tee had the word “KNIT” spaced out with the N and T sitting vertically and the K and I sitting horizontally. This didn’t really feel right, like the letters didn’t naturally fall into place to read “KNIT”. Plus, the narrow neckline combined with the heavier combed cotton and sagging shoulders gave the tee a heavy feeling. So, back to the drawing board. Our first sample of the KNIT tee. Notice the placement of the letters, the sagging shoulders and the narrow neckline. Our second iteration used a cotton/spandex blend. It was thinner, lighter, and felt nice and smooth. Perfect! But the fabric was stretchy. Too stretchy, in fact, and the plastisol ink that silkscreened our design was too heavy on such a light fabric. The neckline, which was wider than the first sample, nicely opened up the neckline and balanced out the loose boxy shape. Third time’s the charm! Our third sample was made with a spandex/cotton blend that was smooth and light but still substantial. It had a very slight sheen and just the right amount of stretch. The letters that spell KNIT were switched around and, to my eye, look much better. This tee was neither too big nor too small. It was neither too light nor too heavy. It was just right. Ah, the Goldilocks principle in action. Our third and final sample is just right – smooth, light fabric, swingy shape and a wider neckline! After three samples and countless changes, the KNIT tee is ready! So, there you have it! Check out the KNIT tee in the shop and on Etsy. It’s a One Size tee, and its oversized boxy shape and can fit most body types. I love this t-shirt. I’ve added it to my wishlist. Fingers crossed Santa puts it under the tree. I do have to say I am disappointed it is offered only in one size. Based on the pictures above, this shirt would not fit at least half of the women in my knitting group. I hope you have the opportunity to expand your range of sizes in the future. Hey Kelsey! Ah, yes. The one size was a decision based on constraint. Since the shirt was custom designed, our minimum order for more than one size would have been really high. So, being a small startup, we were limited to ordering just one size. I hope that makes sense. The decision was made to offer a looser, boxier tee so that women in the XS-M/L size range could fit into it. It does have a 41″ bust, so it can accommodate a range of sizes, although the level of boxiness/looseness will vary depending on actual bust size. Having said that, I totally feel your comment. If the tee sells well, we can design and order more sizes, but for now, we have to start small. That’s great news. I hope things work out to allow more sizes! Love the tee! Hope you sold enough so you can offer it in a much larger size. 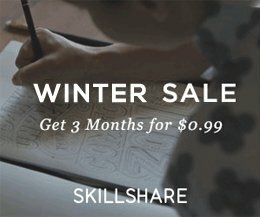 Taking a look at knitters showing off their work on Ravelry, a good portion are of a large or extra-large size. Thanks for your comment, Ellen! We’ve sold about half of our stock without any advertising, which is good news. We’ll have to regroup in the new year to see if we can create a larger size. Fingers crossed, we can! I just got my t-shirt so thank you for the fast shipping! And it’s obvious the care you took in selecting the fabric and designing this. The weight is nice with the perfect amount of stretch. The fit is also fantastic, just the right length! Very very excited to wear it out and about. Hey Orchid! I’m so happy that it arrived so quickly. It was sent via regular air mail, so good on HK Post! Thanks so much for your comment! It made my day 😀 I hope you get tons of compliments wearing this shirt, and who knows? 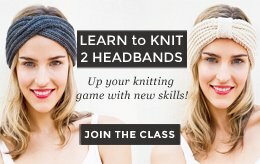 Maybe it’ll start a conversation that will lead to you teaching someone how to knit! Anyway, after wearing it for a bit, if you have any feedback about fit, shape, fabric etc. I’d love to hear it! Am crossing my fingers that you’ll be able to offer it in a One-size -plus. I love it but not for me yet. great website!